A new wonder compound developed by University of Bath scientists in collaboration with King's College London offers unprecedented protection against the harmful effects of UVA radiation in sunlight, which include photo-ageing, cell damage and cancer. Most sunscreens on the market protect well against solar UVB radiation but have limited effectiveness against UVA-induced damage, relying on the reflective properties of creams to defend against dangerous UVA rays. 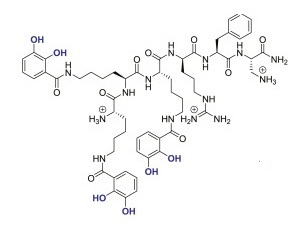 However this compound, called the 'mitoiron claw' by the team, offers strong protection within our cells precisely where the greatest damage from UVA occurs, and doesn't interfere with rest of the cell. The researchers from the University of Bath, working with colleagues at Kings College London, hope to see the mitoiron claw compound added to sunscreens and skin care products within 3-4 years. Free iron concentration is particularly high within mitochondria, the batteries of the cell, where it is needed for several vital functions. However upon exposure to UVA in sunlight, excess free iron acts as a catalyst for the production of toxic reactive oxygen species (ROS), damaging cell components such as DNA, fat and proteins thereby increasing the risk of cell death and cancer. However this custom-designed iron chelator (a molecule that binds to an iron atom like a claw) moves directly to mitochondria where it safely binds the excess free iron, preventing it from reacting upon exposure to UVA rays. Tests with human skin fibroblast cells exposed to UVA radiation equivalent to 140 min of uninterrupted sun exposure at sea level, showed cells treated with the mitoiron claw were completely protected against cell death. Untreated cells suffered significant cell death. Dr Charareh Pourzand, from the Department of Pharmacy and Pharmacology at the University of Bath, said: "The role of iron-mediated damage induced upon exposure of skin cells to UVA has been underestimated for many years. For efficient protection against UVA-induced iron damage of skin strong chelators are needed, but until now these risked toxic effects caused by non-targeted iron starvation of cells. "Our mitochondria-targeted compound provides a solution to this problem and can address an unmet need in the skincare and sunscreen fields. This mitoiron claw is a highly effective compound, offering unprecedented protection against UVA-induced mitochondrial damage." Now that the protective effects of the compound have been demonstrated the team, Dr Charareh Pourzand and Dr Olivier Reelfs from University of Bath and Prof Robert Hider and Dr Vincenzo Abbate at Kings College London, plans further work to explore the potential of this new type of compound. This includes the possibility of developing therapies for diseases involving mitochondrial iron overload, such as Friedreich's ataxia.